Stigma and taboos around menstruation remain largely untouched even to this day. The situation is grimmer in nunneries where period is widely believed to be dirty, impure and something to be embarrassed of. Anim Tenzin Yangki joined Zilukha nunnery four years ago. It was also the year she got her first period. She was 14 then and was totally unprepared for it. “I had no idea what was happening because no one told me about it,” she said. The 18-year-old nun’s story mirrors experiences of other nuns. Menstruation is a taboo subject. It’s hardly talked about in open. Young girls and nuns blush at the mention of word “period”. They are taught to hide it. The Bhutan Nuns Foundation has been striving to break taboos and stigma and normalise menstruation since 2011 with support from UNICEF. And the task has not been easy. Anim Namgyel Lhamo, an Assistant Programme Officer with the foundation is in charge of raising awareness on menstruation in nunneries. “It’s very challenging. Even for me, at first, I was too shy to talk about menstruation. Now, it’s normal for me. It’s like eating food, but the nuns are still shy,” she said. Just like her, the awareness programs on menstruation have helped make menstruation a normal and comfortable subject for the nuns. “The trainings have helped nuns to be open about periods. They are now talking about menstruation,” she said. This was not the case before. “When we first started and showed them pictures of reproductive health, they were so embarrassed. They couldn’t even look at it,” Anim Namgyel Lhamo recalls. Things have improved a lot now, but there’s still a long road ahead. 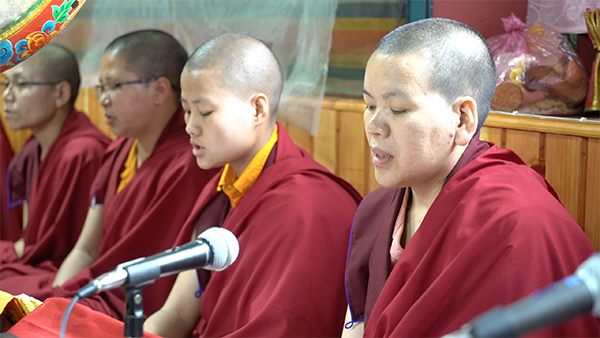 Discussing menstruation is even more challenging in nunneries headed by monks. “They lie to their male teachers about their period cramps and say they have headache and back pain. And lopens find it hard to understand. They say nuns fall ill suddenly,” shared Anim Namgyel Lhamo. Taboos and stigma around menstruation are what inhibits open discussion of menstruation. According to 2017 Knowledge, Attitude and Practices, KAP, Survey on Menstrual Hygiene Management of Adolescent Schoolgirls and Nuns conducted by the Department of School Education and UNICEF, one-third of girls thought they must not enter a shrine or temple during menstruation. Twenty one per cent thought women are vulnerable to possession by an evil spirit during menstruation. Thirty one per cent of schoolgirls and 50 per cent of nuns reported being ridiculed when in classes during their period. Most of the nuns also believe bathing and drinking water during period cause heavy flow, which are not true. Until recently, Ani Tenzin Yangki believed in all these myths and misconceptions. Not anymore. She now knows menstruation is a natural function of a woman’s reproductive system. It’s all thanks to awareness programmes she’s attended over the years. “Now, I don’t feel awkward or shy to talk about periods. I have come to know it’s a very normal thing. That it happens to all women and it shouldn’t be a cause for embarrassment,” she said. Increased awareness is fundamental to breaking silence over periods. The general population, and not just girls and women, should be educated if menstruation is to be normalized. “We have to educate all, including monks and the lay people,” Anim Namgyel Lhamo of nuns foundation said. Sharing accurate information about period with religious leaders is indispensable for influencing social norms and religious restrictions on women and girls. And this is exactly what Anim Namgyel Lhamo does during the workshops and trainings on menstrual hygiene that she leads in nunneries.